Beating up on Obamacare is the easy part. But eventually, many Republicans acknowledge, the website will be fixed, new enrollees will spike, cancellation letters will cease, and the sting of the Affordable Care Act's ugly implementation will fade. At some point, Republicans will have to address the one Democratic rebuttal that cuts deepest: What is the Republican alternative? "I've always believed that we need to have a positive, principled solution as an alternative," said Rep. Tom Price, R-Ga., a leading conservative and medical doctor. "We remain the minority party in Washington, and that's part of the role of the minority--not just to hold the other side to account, but to provide that contrast from a policy standpoint." Indeed, many House Republicans have grown wary of the "party of no" label and are anxious to appear proactive on the health care front. But they have yet to coalesce around a plan. Rep. Fred Upton, R-Mich., chairman of the House Energy and Commerce Committee, recently introduced the "Keep Your Health Plan Act," which would narrowly address the epidemic of cancellation notices from insurers in recent weeks. There also are broader proposals being pushed within the House GOP. Earlier this year, Rep. Steve Scalise, R-La., chairman of the Republican Study Committee, commissioned a working group to craft an Obamacare replacement package. That panel, led by Rep. Phil Roe, R-Tenn., unveiled the "American Health Care Reform Act" in September. 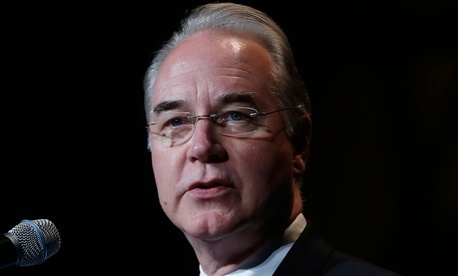 Months earlier, Price, a former RSC chairman who assisted that working group, introduced a third iteration of his "Empowering Patients First Act." Solutions are on the table. The dilemma, GOP lawmakers say, is uncertainty over when--if ever--these ideas will be advanced by House Republican leadership. Speaker John Boehner informed members during a mid-October conference meeting to expect movement on health care legislation in the near future. But according to members in attendance, nobody understood quite what he meant. "No idea," said Rep. Paul Gosar, R-Ariz., a member of the RSC working group, after the meeting. "The speaker didn't get into specifics." According to top Republican aides, Boehner was purposely vague to allow some flexibility on timing. House Republicans have voiced a wide range of opinions on how to approach health care legislation moving forward, and the speaker understands that building consensus within the conference won't happen quickly. "There are a lot of options on the table, but no decisions have been made," said a GOP leadership aide. Of course, Boehner isn't in any rush. His leadership team welcomed this week away from Washington, betting that Obamacare's implosion would speak louder than any Republican criticism. In fact, because of the Affordable Care Act's rocky rollout, Boehner is expected to steer clear of any comprehensive GOP proposal that could distract from Obamacare's afflictions and let Democrats off the hook. "I think the concern leadership has is, instead of talking about all the blemishes and pimples and hiccups of the Affordable Care Act, they'll be talking about what our bill doesn't do," Roe said. Still, the time and organization necessary to push a broader health care replacement package may not exist. That's why Republican lawmakers and aides acknowledge that Upton's bill, which aims to narrowly blunt the impact of Obamacare in one area, is the logical choice for leadership to rally behind. If successful, Upton's bill could spawn other GOP measures targeting specific deficiencies of the Affordable Care Act. This approach, lawmakers say, would allow House Republicans to attempt their incremental dismantling of Obamacare while continuing to denounce the law in broad rhetorical strokes. "If we put a man on the moon 40 years ago, we ought to be able to build a Web page, for God's sake," Roe said, shaking his head. Republicans pushing a comprehensive approach acknowledge that major health care legislation is highly unlikely to pass Congress in an election year. Still, they emphasize the importance of starting the conversation now, while some Democrats are running away from Obamacare, in hopes of building bipartisan support for an alternative proposal. "The more we hear from Democrats who are frustrated and anxious about Obamacare ... that may be a greater opening and opportunity for some larger deal to move forward. It will take bipartisan activity," Price said, adding, "The last thing we need is another absolutely partisan bill."